I'm getting worried. I'm starting to think you may not believe me. I have such lofty praises for nearly every one of the recipes in Room for Dessert that it might seem that I am not particularly discerning when it comes to food. In fact, I am ridiculously picky. Not picky in the sense that I am not an adventurous eater, but I have quite high standards and am hard to impress. I would ask you to trust me. I am a very good judge of food, and I know what tastes good. Nearly every recipe I have made has been spectacular. 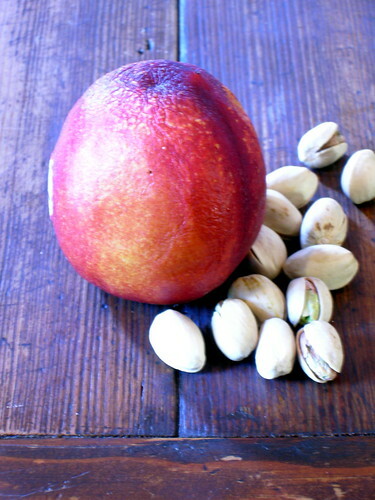 These nectarines were no exception. They were a last supper of sorts, as tomorrow is Ash Wednesday, the beginning of Lent, and Catholics are meant to fast. I decided to forgo the traditional pancakes and enjoy these honeyed delights instead. 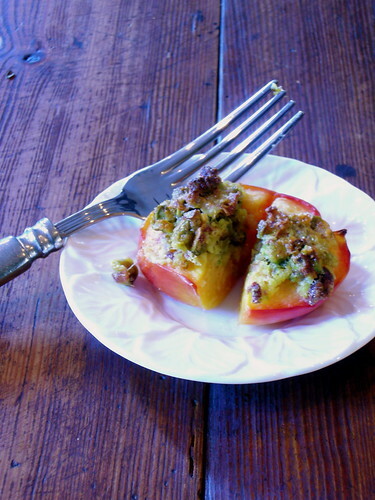 These peaches were a beautiful way to celebrate Mardi Gras. They may just become a tradition, although I would likely add a few more treats to the list in the future. I could see these as a nice little breakfast treat or a refreshing and (somewhat) healthy dessert in the summer. I am so glad I chose these as my last indulgence. Preheat the oven to 350. Beat the butter, sugar, and egg yolk together. Stir in the pistachios, ginger, lemon zest and salt. Scoop out some of the fruit to make more room for the filling. Pack 2 teaspoons filling into the cavities. 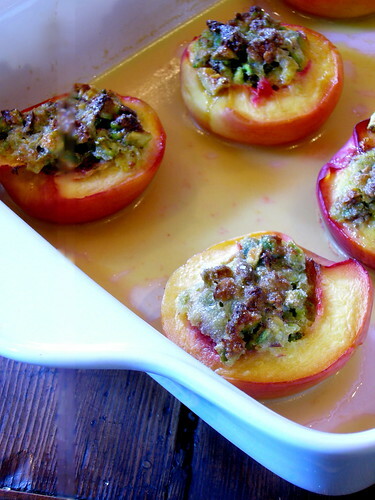 Place nectarine halves in a shallow baking dish. Pour 1/2-inch of wine into the bottom of the dish. Sprinkle nectarines with sugar and bake for about 40 minutes, until the filling has browned and the nectarines are cooked through. I really like this recipe. It's a different direction for you.